This 14 Day Lantern Will Probably Outlast Your Interest In Being Outdoors | OhGizmo! 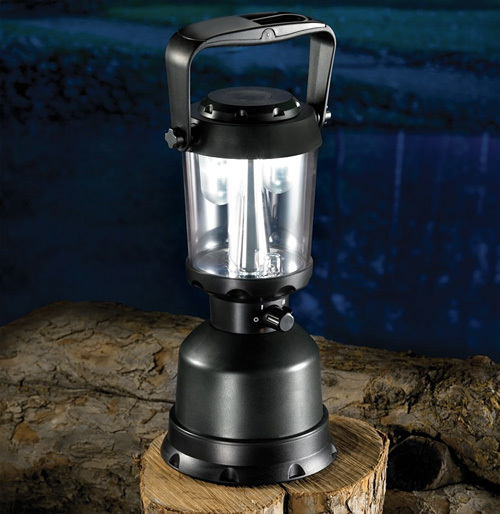 On a set of 4 x D-sized batteries this LED lantern will run for an impressive 336 consecutive hours, on its lowest setting of course. But that equates to 2 whole weeks of illumination which is easily more time than most people can tolerate camping or even being outdoors. In fact at full brightness it can still run for 175 hours non-stop, or just over a week, which again is probably longer than most people can stand to be away from the safety of their online social networks. It’s also completely waterproof and will remain buoyant and fully operational if dropped in water, perfect if you’ve chosen a really, really poor place to set up camp. $49.95 from Hammacher Schlemmer. I've gone to their site and they claim 160 lumens for 336 consecutive hours. So let's say that they are geniuses and designed the most efficient LED possible. Then their 160 lumen LED would be 0.53 Watt. 178 Wh. This thing is powered by 4 D batteries and the maximum capacity of such battery is 15Wh so to keep it running that long you would need 12 D batteries. @Raz – thanks for math. Sounds like this device needs to be tested against the claims. Just say'n. Must say I agree, I quite like camping but there is noway I would camp for two weeks. Also, when I go camping I enjoy the satisfaction of having an open fire to provide heat and light rather than a battery lamp.